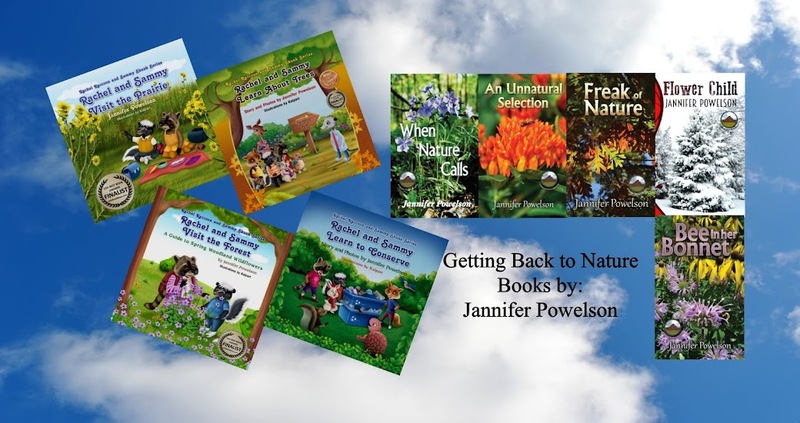 Born and raised on a farm in Northwestern Illinois, Jannifer Powelson's interest in conservation and the natural world was sparked at an early age, and so was her love of reading and writing stories. Powelson's education in nature continued at college, and she graduated with a Bachelor's Degree in Biology from Knox College in Galesburg, Illinois and a Master's Degree in Biology from Southern Illinois University - Edwardsville. She conducted thesis research in Northern Illinois, where she spent her free time identifying and photographing prairie plants. Many of these plant photos are featured in the first book in the Rachel Raccoon and Sammy Skunk Series, Rachel and Sammy Visit the Prairie. The main characters, Rachel Raccoon and Sammy Skunk, were derived from Powelson's wildlife research on raccoons, where she also experienced a few interesting and stinky incidents with skunks. Rachel and Sammy Visit the Forest - A Guide to Spring Woodland Wildflowers is the second book, and Rachel and Sammy Learn About Trees is the third book in the series. The fourth of these fun and educational books, Rachel and Sammy Learn to Conserve was released in the spring of 2013. Ms. Powelson released the first book in the Nature Station Mystery Series, When Nature Calls in 2014 and An Unnatural Selection in 2015. Freak of Nature and Flower Child were published in 2017 . The fifth book in the series, Bee in her Bonnet will be released soon. Jannifer is employed as a conservationist and resides in Princeton, Illinois with her husband and two daughters. She enjoys reading, writing, photography, nature, and travel. In 2012, she co-founded Progressive Rising Phoenix Press and serves as the Chief Financial Officer. Hi Renee! Thanks so much! "Rachel and Sammy Learn to Conserve" should be ready in a few weeks. Text, illustrations, and photos are done, and hopefully the layout and covers will be soon! I will be sure to let you know. Thanks for hosting the Kid Lit Blog Hop!